Naomi Klein is a writer and activist. She is the author of This Changes Everything: Capitalism vs The Climate (2014), The Shock Doctrine: The Rise of Disaster Capitalism (2007) and No Logo (2000). Klein is one of the organizers and authors of Canada's "Leap Manifesto", a blueprint for a rapid and justice-based transition off fossil fuels. Her latest book is No Is Not Enough: Resisting Trump's Shock Politics and Winning the World We Need (2017). On the show today, Inspired to Action - ideas on what it takes to start a movement and, perhaps more importantly, what it takes to keep that movement going. 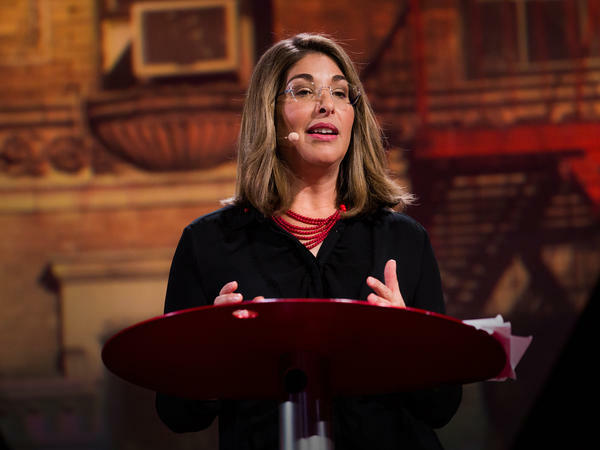 NAOMI KLEIN: Mass movements always take people by surprise. RAZ: This is writer and activist Naomi Klein. KLEIN: You know, and if you talk to organizers, they'll admit there's a certain magic to it - of just like why this time and not last time, you know? So I'm interested in that question - why this time and not that time? - but also because I've been around for a little while. And I've seen some of these magical moments, and I've seen them kind of disappear as quickly as they arose. I've become increasingly interested in what keeps people in motion. What's the glue? RAZ: Here's Naomi Klein on the TED stage. KLEIN: And I'd say this is a pressing question these days because things are pretty shocking out there. And now there's no shortage of people who are sounding the alarm. But as a society, I don't think we can honestly say that we're responding with anything like the urgency that these overlapping crises demand from us. And yet we know from history that it is possible for crisis to catalyze a kind of evolutionary leap. And one of the most striking examples of this progressive power of crisis is the great crash of 1929. And this was taken by many as a message that the system itself was broken. And many people listened, and they leapt into action. Now these reforms were far from perfect. In the U.S., African-American workers, immigrants and women were largely excluded. But the depression period, along with the transformation of allied nations and economies during the World War II effort, show us that it is possible for complex societies to rapidly transform themselves in the face of a collective threat. Now if that's really what it took, then why isn't it working anymore? Why do today's nonstop shocks - why don't they spur us into action? RAZ: So this is the question. It's a question I asked Simon Sinek earlier in the show because it seems like people are really upset about a lot of these global crises. But they're not - nothing seems to be changing. So what's the missing element now? KLEIN: Well, I think that the real missing ingredient - or one of them - has to do with, you know, what I would call the utopian imagination - of not just a horror and rejection at something that we're seeing now but an actual articulated vision of the world we want instead. And I think that previous generations of activists, of organizers, you know, for better and worse, had that utopian vision of the world they wanted instead. They didn't identify as, you know, I am an environmental activist. I am a women's rights activist. I am a civil rights activist. It was more like, I'm a revolutionary. I am not just resisting what I don't want. I know the world I want instead. And I think that it's in that interplay between a vision of the world we want instead and a horror in the face of what our current system is producing that both catalyzes these people into movement and keeps them in the movement because the posture of rejection, of enough-ness (ph), of no is a powerful catalyst to bring people in the streets. But it's an exhausting posture to maintain. And I think part of the burnout comes from the fact that what sustains people in struggle is that hope of what there could be instead. Rejection alone, I think, turns toxic. And it's just exhausting. It's fight or flight. You can't stay in fight or flight forever. KLEIN: We are living at a time of extraordinary political engagements. Politics is a mass obsession. And yet this still doesn't add up to the kind of holistic and universalist vision of a different world that our predecessors had. So why is that? Well, very often we think about political change in defined compartments these days - environment in one box, inequality in another, racial and gender justice in a couple of other boxes, education over here, health over there. And within each compartment, there are thousands upon thousands of different groups and NGOs each competing with one another for credit, name recognition and, of course, resources. So for instance, the people fighting poverty and inequality rarely talk about climate change even though we see time and again that it's the poorest of people who are the most vulnerable to extreme weather. The climate change people rarely talk about war and occupation even though we know that the thirst for fossil fuels has been a major driver of conflict. The environmental movement has gotten better at pointing out that the nations that are getting hit hardest by climate change are populated overwhelmingly by black and brown people. But when black lives are treated as disposable in prisons, in schools and on the streets, these connections are too rarely made. RAZ: When it comes to building a sustainable movement, is it about sort of breaking down these compartments that you describe and then trying to connect all these different groups and issues? KLEIN: I think it is. And I think that, over the past 30 years, there has been this process of extreme professionalization of activism - where we carve the world into these single-issue silos, and then people get funding based on which silo they're in. And it makes movements more inclined to set out very compartmentalized achievable wins that they can then go back to their funders saying look. We won, right? But if you're talking about deep systemic change, whether it's, you know, in the face of systemic racism or whether it's in the face of climate change or whether it's in the face of economic inequality, you're not going to get that easy win. You know, it's going to take decades. RAZ: When you think about all of these enormous challenges - these generational challenges, these civilizational challenges - that the human race faces, are you optimistic? I mean, do you think that we will actually rise to these challenges and build the movements required to overcome them? KLEIN: I have good days and bad days on that question. I think about the stakes of - you know, if we don't change, then what happens? Then what does the future look like for my 5-year-old son? It's so unacceptable. It is so dangerous. And maybe it's time for the people who have stopped believing change is possible to step aside and just make some room. You know, one of the things you realize is there is a natural regeneration in social movements when young people come in who have not experienced as many disappointments and setbacks. And they're raring to go and refuse to accept no for an answer and impossible for an answer. I see that in the way the Parkland teens responded to challenges that their movement only represented a narrow experience of gun violence and didn't get defensive and listened and are creating - helping to create a more diverse movement. I'm seeing a generation come up - not just with more energy and optimism but with seemingly a greater capacity to break down silos, evolve, listen. You know, that gives me hope - that they're dreaming again. They're not afraid of big ideas. And I take tremendous hope from that. UNIDENTIFIED PROTESTERS: (Chanting) We want change. We want change. We want change. CAROLE KING: (Singing) Where you lead, I will follow anywhere that you tell me to. If you need - if you need me to be with you, I will follow where you lead. RAZ: Hey, thanks for listening to our show Inspired To Action this week. If you want to find out more about who was on it, go to ted.npr.org. To see hundreds of more TED Talks, check out ted.com or the TED app. Our production staff here at NPR includes Jeff Rogers, Sanaz Meshkinpour, Jinae West, Neva Grant, Rund Abdelfatah, Casey Herman and Rachel Faulkner, with help from Daniel Shukin and Diba Mohtasham. Our partners at TED are Chris Anderson, Colin Helms, Ana Phelan, and Janet Lee. I'm Guy Raz. And you've been listening to ideas worth spreading right here on the TED Radio Hour from NPR. Transcript provided by NPR, Copyright NPR.